Once you are up and running, there are many ways to publicize your gemach. First, email all of your friends to let them know that you are offering a new service. If you live in a large Jewish community, many local Jewish directories include a listing of local gemachs where you can advertise. Hamodia Newspaper publishes a list of gemachs every week in their Tuesday edition. To add your gemach, email classifieds@hamodia.com. Perhaps the most famous gemach directory is printed by Hakhel. To order a copy of the directory or to add your gemach to the list (if it's in the New York metropolitan area), email information@hakhel.info . 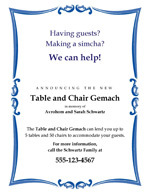 In addition to listing your gemach in these directories, you should make flyers announcing your service. The flyers can be posted in local shuls, restaurants and stores (with their permission, if required) and distributed to families in your neighborhood. If you use Microsoft Word, there are many professionally designed flyer and poster templates available for free. 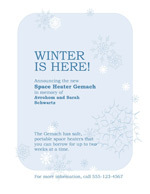 We have included two flyer templates below, which you can customize for your gemach. Just click on the templates below to get started.